A quick update (9/3/2013) – since I now have a couple of stills of the film, I thought I’d add them to the post, though I’ll leave the photos from Robert’s book (below), as they give a better sense of what happens in the film on a frame-by-frame basis. I have to thank the wonderful Michelle Puetz for turning me onto Robert Russett’s films. Her enthusiasm for them really encouraged me to seek them (and him) out, eventually bringing his collection to the film archive in 2011 after a couple of years of correspondence and discussion. Various originals for the films of Robert Russett as they arrived in 2011. Robert has been based in Louisiana for decades, making (I believe) just about all of his films there. Though stylistically diverse, and employing a number of different aesthetic styles and techniques, there’s a consistency of vision which is really deeply intelligent, and even, I would say, startling. His abstract works (Brain Field, Primary Stimulus, Neuron, etc.) are intense and powerful, and employ unusual visual motifs and techniques to investigate (I would NOT say “play with”) the deeper recesses of perception and cognition. The rephotography-based films (Aprés-Midi, L’Acadie, etc.) are lyrical, but dark and searching, unsettling and elegiac. All of Robert’s films were made in reversal. 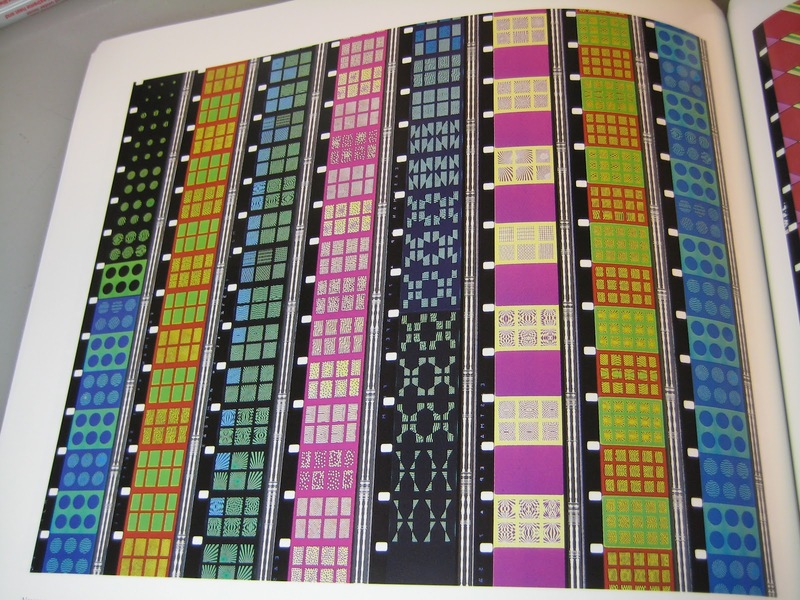 With a few early exceptions, his color films were all made in Ektachrome, and usually printed on Ektachrome print stocks (primarily 7390). 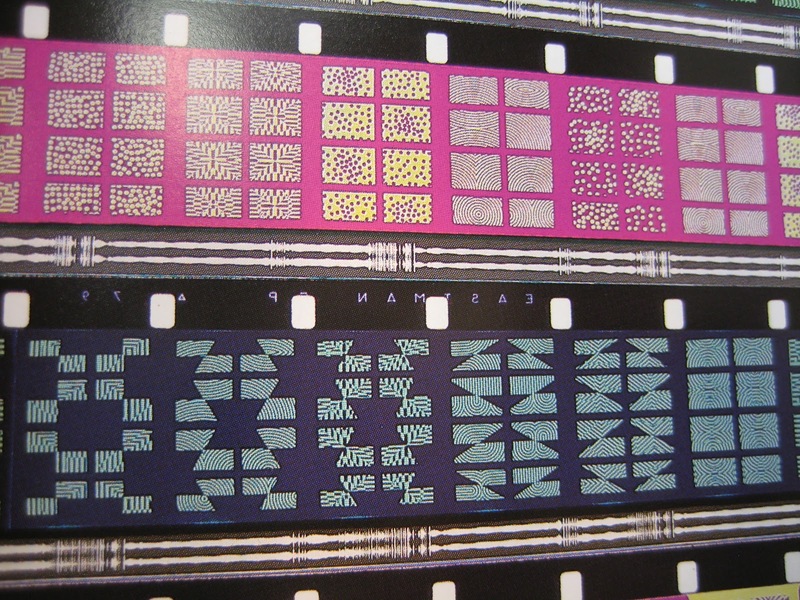 The use of Ektachrome over Kodachrome (in both shooting and printing) gave somewhat less saturated, more delicate results, which Robert favored. Early attempts at making internegatives for the films failed as well, giving results that Robert felt simply didn’t capture the intended look of the films at all, particularly with the rephotography pieces. With improvements in Kodak’s internegative and print stocks since the 1970s, and particularly with the high quality lab work available at specialty labs like Colorlab (where I’m working on Neuron), I was pretty confident we could get results with new internegatives that Robert would be happy with. 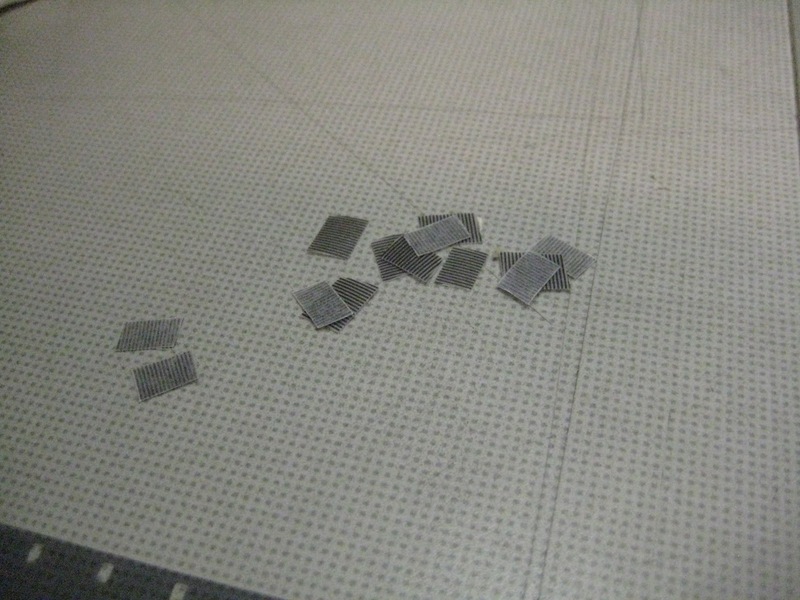 The film, which is about six minutes long, is made up of two halves, more or less. 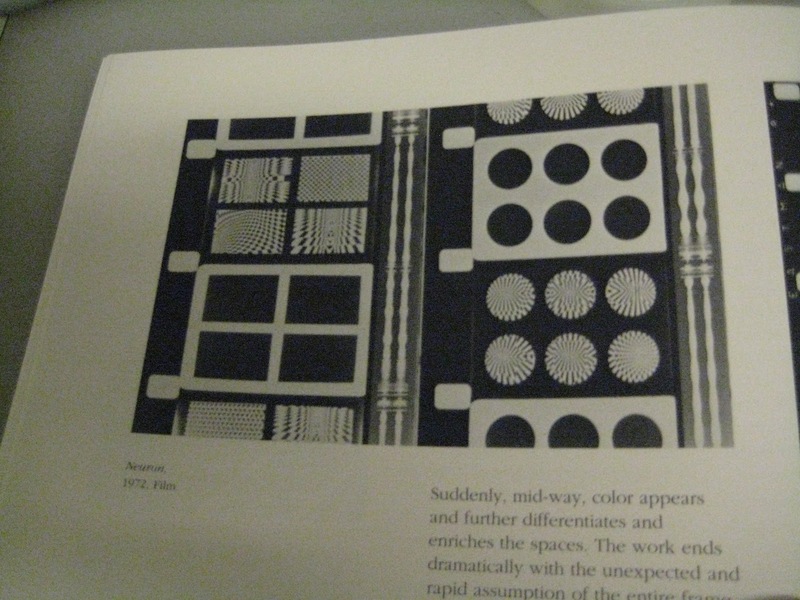 The first half is black and white, shot on Tri-X, the second half is a color articulation of some of the motifs introduced in the first half. Robert may correct me, but it looked to me to be on 7389 Ektachrome print stock, possibly printed via some multi-part color additive process. 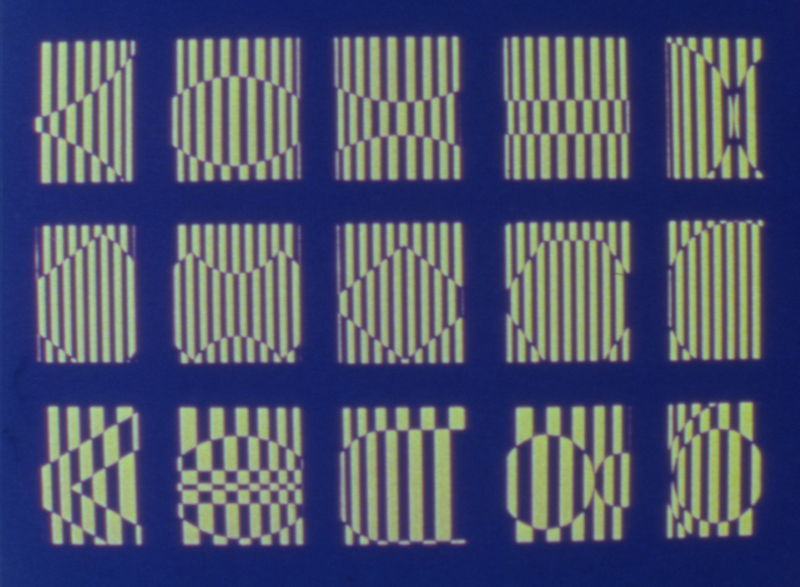 The imagery of the film consists of different ‘windows’ containing what could perhaps be described as op art patterns, which move and transform rapidly, with recurring flicker patterns. The soundtrack is a repetitive, insistent, ratchety sound which crackles with nervous, propulsive energy. 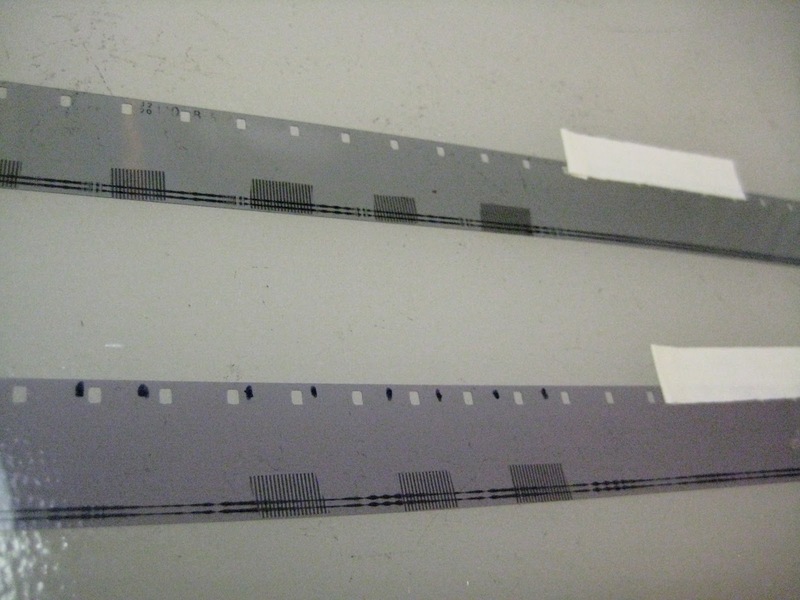 The original for the film is cut into a single printing roll, an A-roll only, and is in great condition, with no damage. The color half has some very mild color shifting, but nothing we can’t fix in timing. The goal in printing the picture is to get the black and white to look as black and white as possible on the color print stock, as well as match the colors as well as possible to the extant Ektachrome prints. After I get an approved print, it’ll go to Robert as well, for his evaluation. Although the picture presents some minor challenges, the sound is really where this project gets unique. As I mentioned above, the soundtrack contains a repetitive motif which is (as far as I can tell) consistent and unchanging for the duration of the film. 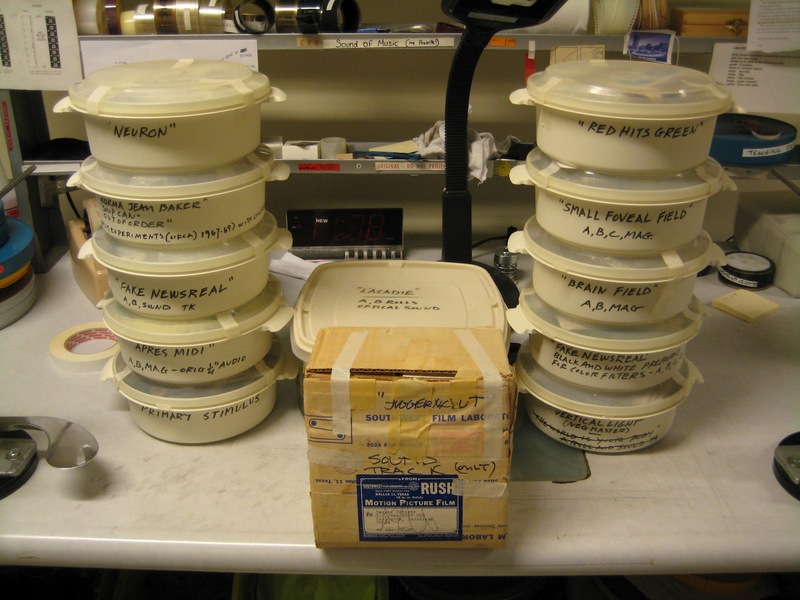 The original sound elements I received from Robert were an original 1/4” tape, a 16mm fullcoat mag track, conformed to the original, and an optical track negative. 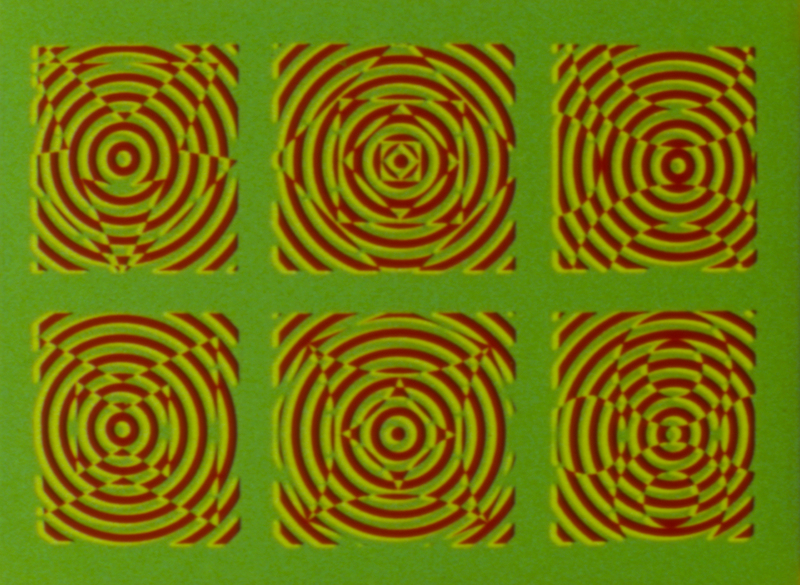 All contained the same recorded content, but the optical track differed in one regard that brought the sound restoration of the film into the realm of the unusual. 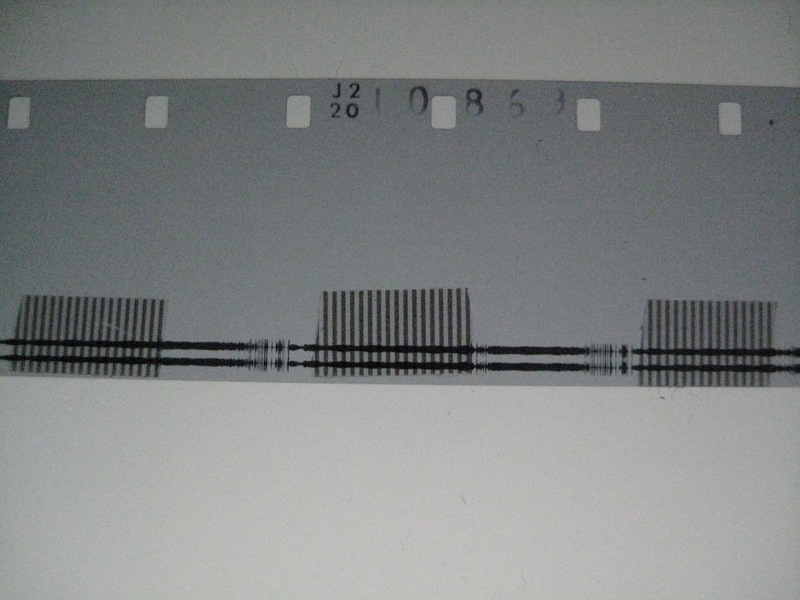 As would be the standard thing to do, the track negative was shot from the conformed 16mm mag, and contains the same audio content. However, in the course of finishing the film, Robert decided the track needed a little extra element near the very end of the film, to amp things up at that moment and heighten the film’s intensity. 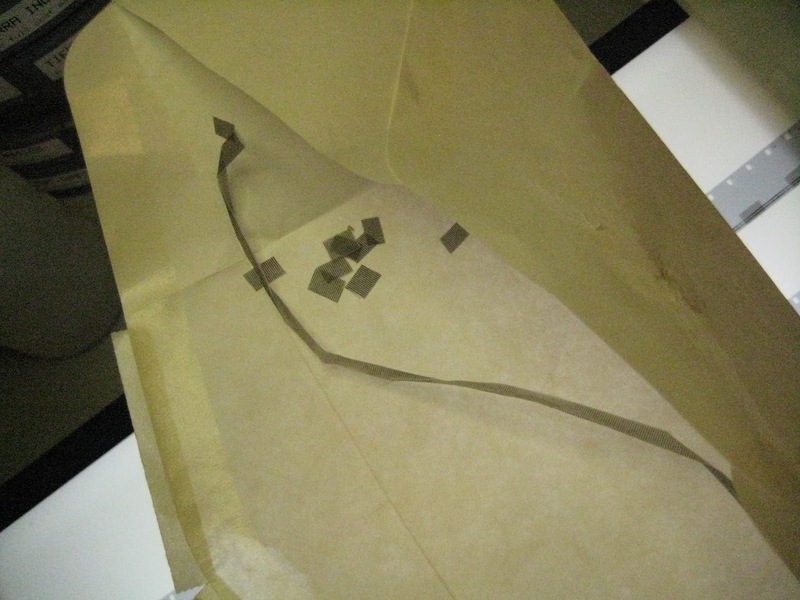 Having at least some interest already in experiments in graphical, synthetic sound (taken to a fantastic level with his 1977 film Primary Stimulus), Robert decided to add these adhesive line patterns – 28 little pieces of them in all – directly to the track negative itself. 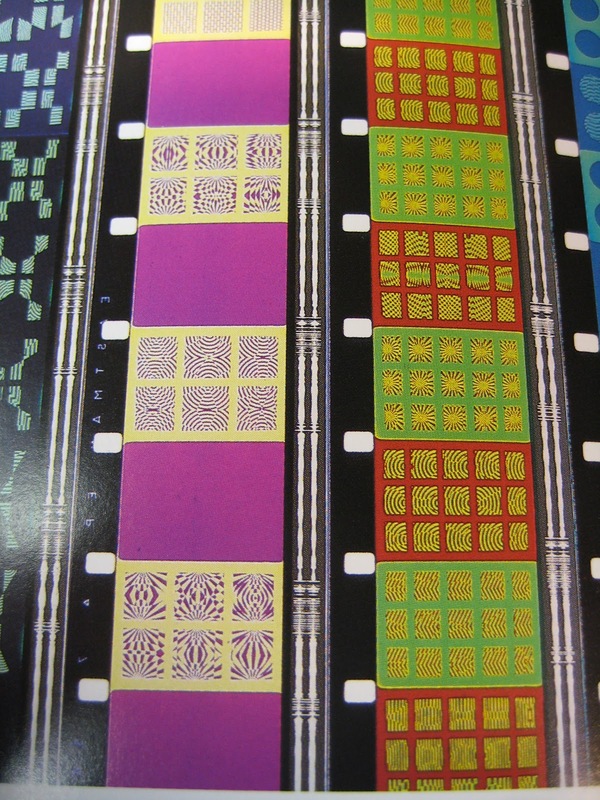 The result is that all prints of the film made from that track negative would have these line patterns printed in, which, when shown on a projector, emit a rapid beeping sound at the film’s climax, on top of the existing recorded track. Although it would perhaps be a bit easier in doing the film’s sound restoration, to re-recorded the sound from this track negative and create a restored track with those beeps built in, to create a “fool proof” version of the film’s soundtrack, I felt that this would be a conceptually impure approach. 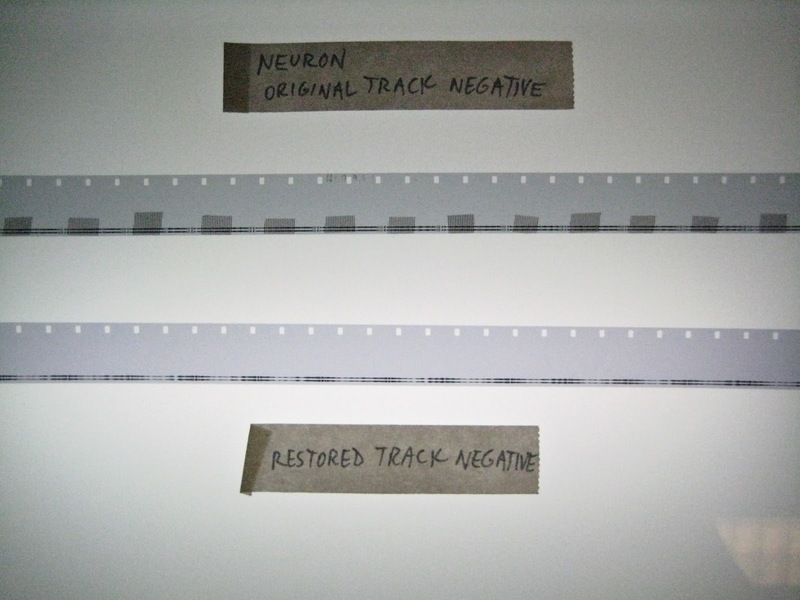 The graphical, synthetic, NON-recorded element of the track would be lost, the evidence of this technique and conceptual approach would be absorbed and normalized, neutralized in the film’s reprinting. 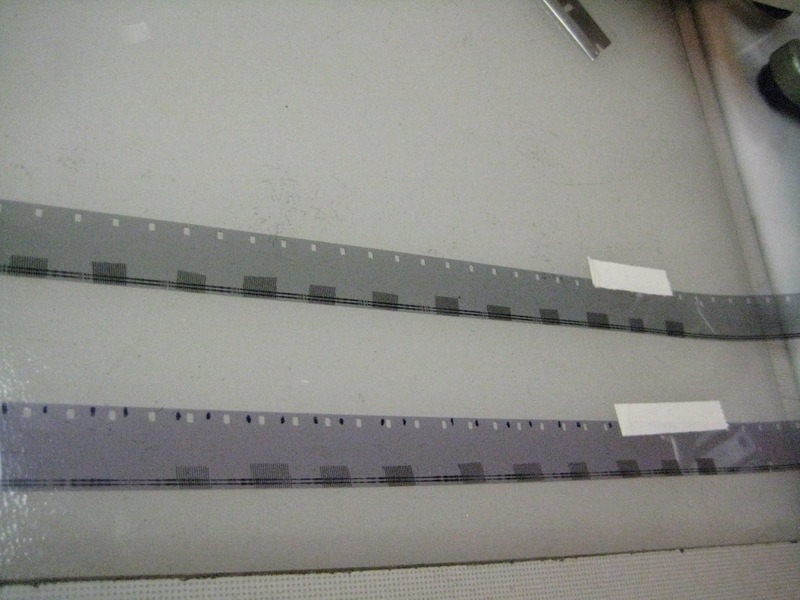 Backing up a bit, the sound restoration was done by transferring the original 16mm mag, checking it against a transfer of a vintage print to make sure it synched exactly (which it did), then performing only a little EQ and fixing a few dropouts that had developed in the mag over time. 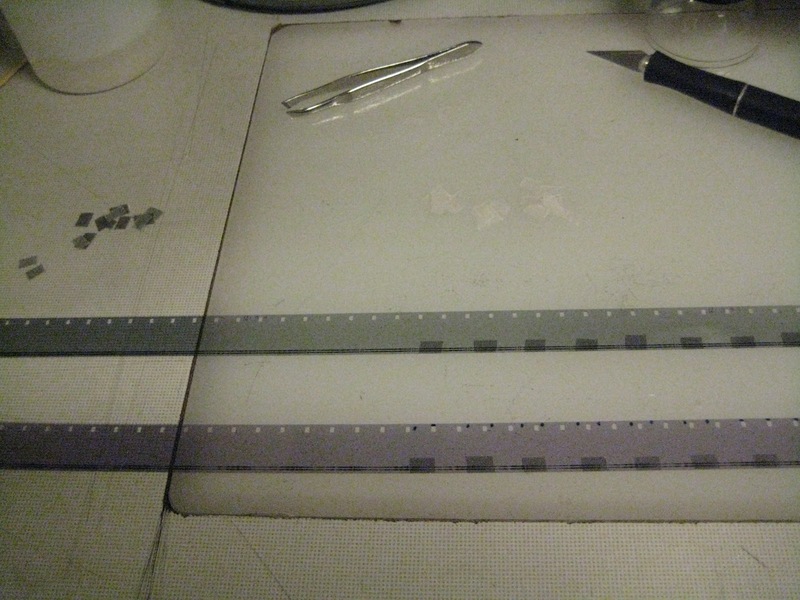 Then a new A-wind track negative was made for printing with the internegative. A 35mm preservation mag and digital backups were made as well, on which we also included the transfer of the reference print, just in case. 28 stickers later, I cleaned the track up with a little bit of film cleaner, let the whole thing sit for a bit, then rewound it and sent it to Colorlab for printing.